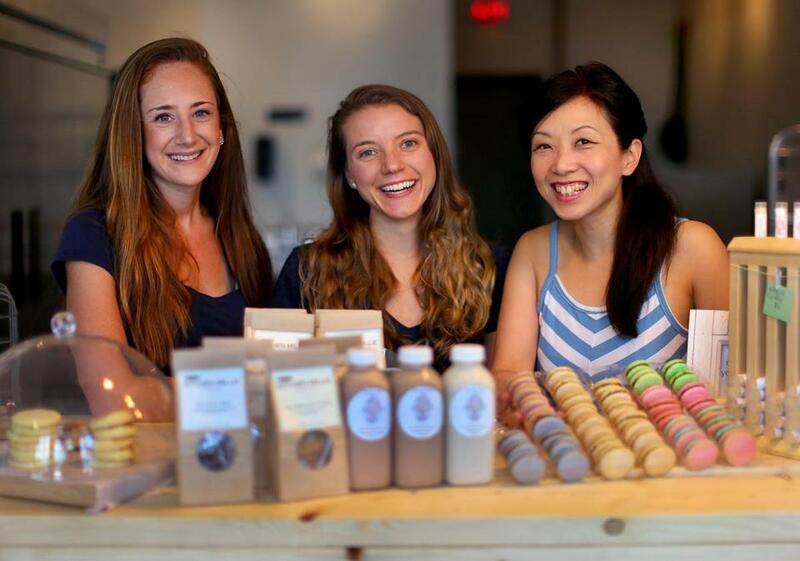 The Local Fare owners (from left) Michelle Wax of Kitchen Millie, Caroline Huffstetler of Nutty Life, and Rita Ng of Boston Bonbon. Opening a professional kitchen of one’s own is no easy task. Paying rent, securing permits, and buying equipment requires a hefty investment of time and money. Which is why many budding food entrepreneurs have turned to local shared kitchens, like CommonWealth Kitchen in Boston and Stock Pot Malden. But the three women who own the Local Fare, the small shared kitchen and retail space that opened in Arlington last month — Michelle Wax of Kitchen Millie, Caroline Huffstetler of Nutty Life, and Rita Ng of Boston Bonbon — were looking to share the load of launching a new kitchen while still having a place they could call their own. Partner Wax also makes cookies, two-bite ones that are customizable. But Wax doesn’t see her partners as competition. “Basically we were all looking independently for our own spaces, but as I’m sure you know, it’s expensive, and it’s a big effort. This was just so much more fun, and enjoyable, and awesome to be able to do it with two other businesses,” she says. Ng, who makes macarons in unique flavors like Vietnamese iced coffee and maple bacon, thinks it’s useful that they have similar baking backgrounds, bringing knowledge from their previous shared-kitchen experiences. They also share a business philosophy. “We really want to emphasize local as the theme of our store, we make everything here by hand, and people are supportive of that. . . . It’s something that builds the community and the economy,” Ng says. The 800-square-foot space is used as a production facility for the three individual businesses, and also has a retail space featuring local products in addition to the sweet treats and nut milks from the owners. “We are bringing in people we know from the farmers’ markets that may not be at the [production] level of Whole Foods, but they have great products. Customers can expect a one-stop shop for local products from Boston,” says Wax. They currently sell only packaged products but would like to expand and perhaps have a cafe-type setting in the future. Other food entrepreneurs have been supportive, and are taking notice of their model. “We’ve already had a few people come up to us and ask if they can work out of the kitchen, and want to collaborate with us,” says Wax. Huffstetler says they are excited about working with other businesses and could possibly rent out their kitchen to other local startups at some point, but they aren’t looking to return to the space-squeeze of a traditional shared kitchen. For now, it seems, three is the perfect-size crowd.